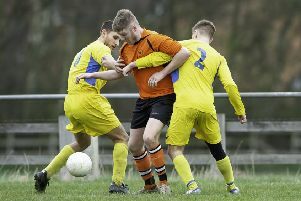 Norristhorpe completed a club double with victories in the Yorkshire Amateur League last Saturday. Norristhorpe Reserves completed a club double as they overcame second placed Drighlington Reserves 2-0 in Division Four. Drig missed early chances, while Liam Ramsden put Norristhorpe 1-0 up at half-time as he slotted home after Sam Everett’s initial shot rebounded off the crossbar. Norristhorpe soaked up further Drighlington pressure after the break and then struck on the counter attack as Jack Holden’s crossfield ball found Brad Wild who ran through and fired home to seal the win, as George Woodcock produce a man-of-the-match display. Dewsbury Rangers Reserves led 2-0 early in their game against St Bedes Reserves, who hit back to level before half-time and went on to complete a 6-2 win, in which Carl Lomax fired a hat-trick, Tom Mozeley and Umear Aslam also struck with an own goal completing the tally. Dewsbury Rangers first team suffered only their second defeat in their last eight matches as they went down 4-1 at home to Farsley Celtic Juniors Reserves in Division One. Aaron Wroe struck a 60th minute goal for Rangers but Farsley had Adam Kellett, Danny Kemp, Hayden Crossley and Jake Thompson on target to seal victory. Littletown remain bottom of Division Two after a 3-2 defeat at Leeds City Reserves. Savile United remain top of Division Five and maintained their unbeaten run with a 7-3 victory away to Huddersfield Amateur Reserves. United led 3-1 at half-time and although Huddersfield attempted to fight back, as Scott Milloy and-man-of-the-match Jos Vetch (two) scored, the Dewsbury side ran out comfortable winners. Isan Safeer led the way with a hat-trick, Hanzah Taran struck a brace, with Shashid Patel also on target. Batelians remain just behind United after they returned to winning ways with a 6-3 victory over Thornesians Thirds. Batelians led when Razeb Raja’s shot was saved but Michael Smith scored from the rebound, only for Thornes to equalise. A Darren Inman shot from the edge of the area landed at the feet of Rob Hiscox, who slotted home before Inman set up Smith’s second as Batelians led 3-1 only for Thornes to score again before half-time and then made it 3-3 after the re-start. Craig White headed home a cross to edge Batelians back in front, Hiscox added his second and a Lee Kaye tap in completed the win. West End Park were edged out 3-2 by third placed Tyersal Reserves, who remain two points behind Batelians. West End went into the break level at 2-2 after goals from Joe Elliot and Lyndon Wells. Tyersal scored the only goal of the second half to seal victory and had Aiden Lowther (two) and William Lowther on target.